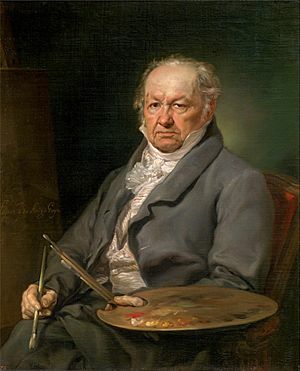 Francisco de Goya y Lucentes (30 March 1746 – 30 April 1828) was a Spanish painter. He painted many portraits of the Spanish Royal Family. His most famous paintings are Charles IV of Spain and His Family and The Third of May 1808. He regularly painted the famous Duchess of Alba. The Family of Charles IV, 1800. Goya was born in Fuendetodos, in the region of Aragón, Spain, in 1746. His parents were José Benito de Goya y Franque and Gracia de Lucientes y Salvador. He spent his childhood in Fuendetodos. His father's work was gilding (putting gold onto picture frames). In about 1749, the family moved to a house in the city of Zaragoza. Goya went to school at Escuelas Pias. He became best friends with Martin Zapater. Through their lives, they wrote many letters to each other. Because of these letters, historians know a lot about Goya's life. When he was 14 Goya became an apprentice to the painter José Luzán. Goya later moved to Madrid where he studied with Anton Raphael Mengs, a painter who was popular with Spanish royalty. Goya and Mengs did not like each other, and Goya got bad marks in his examinations. Goya tried to join the Spanish Royal Academy of Fine Art in 1763 and 1766, but failed. He then traveled to Rome. In 1771 he won second prize in a painting competition in the city of Parma. Later that year, he returned to Zaragoza. He got work painting frescos in several buildings including the dome of the Basilica of the Pillar. He studied with the painter Francisco Bayeu y Subías. His painting began to show the style which later made his famous. Goya married Bayeu's sister, Josefa, in 1774. Francisco Bayeu was a member of the Spanish Royal Academy of Fine Art. This helped Goya to get work with the Royal Tapestry Workshop. He worked there for 5 years, and designed 42 patterns. Many of his designs were made into tapestries and used to decorate the bare stone walls of the royal palaces, such as El Escorial. The Spanish Royal family saw his works and later gave him work as a portrait painter. He also painted an altarpiece (Holy picture) for the Church of San Francisco El Grande. Because of this picture, Goya was at last made a member of the Spanish Royal Academy of Fine Art. In 1783, the Count of Floridablanca, commissioned Goya (gave Goya the paid work) to paint his portrait. Then King Charles III of Spain and other important people wanted Goya to paint their portraits. Goya became friends with Crown Prince Don Luis, and lived in his house. From 1788, in the reign of Charles IV, Goya became even more popular. In the 1790s Goya became ill. It is not known exactly what his illness was. It is believed that he suffered mental breakdown. He may have had viral encephalitis or several strokes. He may have suffered from dementia. It is also thought that he may have been poisoned by lead paint. His sight, hearing, balance and mental health were all affected. From the 1790s onwards he began to paint pictures showing sad, violent subjects. His unhappiness was also affected by the French invasion of Spain in 1808. One of his most famous paintings, The Third of May 1808, is about the execution of Spanish men trying to defend their country. After the defeat of the French, Goya did not get on well with King Ferdinand VII. Goya moved to a house far away from the court. He lived there with his housekeeper and her daughter, and taught painting to the girl, Rosario Weiss. Some of the walls of the house are painted with strange dark pictures, but it is not sure whether Goya did them. For two years Goya lived in France but returned to Spain where he was warmly welcomed home in 1826, He died in 1828 at the age of 82. Goya's early cartoons for the royal tapestries are merry scenes of festivals in bright colours. Goya painted portraits of many famous people, including the Duke of Wellington. His paintings of the Royal Family of Charles IV of Spain and Ferdinand VII show them looking like very ordinary people, not like proud nobility. Queen Maria Luisa was delighted with the large portrait that he did of her family in 1800, even though a French writer Théophile Gautier said that Goya made them look "like the corner baker and his wife after they had won the lottery". In 1793 and 1794 Goya was recovering from his illness. During this time, he painted eleven small pictures painted on tin. These pictures are known as Fantasy and Invention today. They show a change in his art. From that time on, he painted dark, frightening pictures about war, violence and madness. One painting is called Courtyard with Lunatics. It is a scene in a mental asylum. It is about loneliness and fear. It shows how mentally ill people have trouble dealing with other people and normal life. Goya was the first artist to paint people with mental illness in a realistic way. Goya wanted to show that it was wrong to punish mentally ill people, and lock them up with criminals. There was a movement at this time to improve the life of people in asylums and prisons. Goya made two series of prints. The first was called Caprichos and the second was called The Disasters of War. The Caprichos series shows nightmarish scenes of the problems with Spanish society. The Disaster of War shows scenes of terrible violence. These were not published until more than 30 years after his death. The Disaster of War were made because of the war between France and Spain. One of Goya's most famous paintings is a large picture called The Third of May 1808. (see above) It is about the executions of Spanish men that took place in 1808. This painting shows the courage of the unarmed Spanish hero. It shows the French soldiers in the firing squad acting as if they have no minds or feelings. This painting was a great inspiration to other painters such as the French painter Manet who painted a scene of the execution of the Governor of Mexico. Goya's most frightening picture shows a giant man, eating people. It is now called Saturn Devouring His Sons, (after Saturn the Father of the Gods in Greek mythology) but no-one knows what it really means. It is more likely a picture of the way that War destroys people. In the house that Goya owned, there are paintings on the walls known as the Black Paintings. They show scenes with the Devil and witches. It is not sure whether Goya really painted them. Goya's brightly coloured tapestry cartoons influenced the French Impressionist painters such as Monet and Renoir. His portraits were an influence on Manet and Degas as well as Renoir. The Black Paintings influenced Expressionist painters. Francisco de Goya Facts for Kids. Kiddle Encyclopedia.